Would you like to track eCommerce sales data for your WooCommerce or Easy Digital Downloads store? You can view the number of transactions and revenue your website generates in Google Analytics. In this article, we’ll show you how to track eCommerce Sales in Google Analytics. Why Track eCommerce Sales in Google Analytics? You can keep track of the performance of your sales and revenue. You can get important Key Performance Indicators (KPI) that are vital to your business like average order value, eCommerce conversion rate, and per session value. You can make data-driven decisions to generate more sales and revenue from your eCommerce store. Note: This guide requires you to install the MonsterInsights plugin and the MonsterInsights eCommerce addon on your site. To access the addon, you must have the Pro license plan. 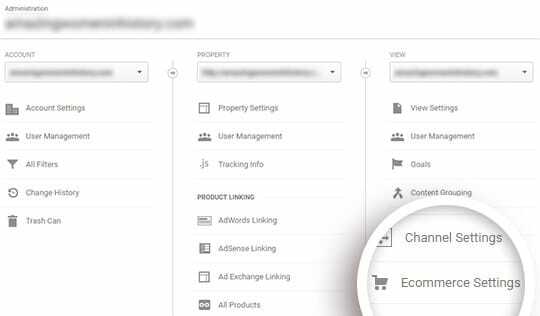 First, log into Google Analytics and select the correct website you’d like to enable eCommerce tracking for. 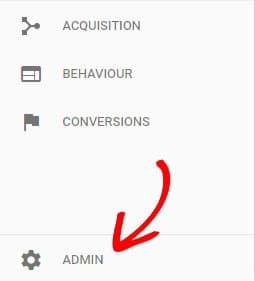 Next, click Admin in the right-hand menu bar. 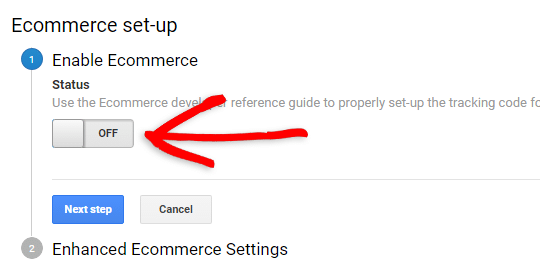 Now you can click Ecommerce Settings under the column on the right. Next, click the slider under the first step, Enable Ecommerce, to turn it from off to on. Then click the Next Step button. 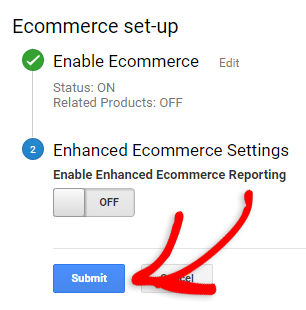 If you like, you can turn on the Enhanced Ecommerce Settings, but it’s not mandatory. For more details, see our guide on how to enable Enhanced eCommerce in WordPress. All you have to do now is click the Submit button. If you haven’t installed the MonsterInsights plugin yet, you’ll need to install it and authenticate it with your Google Analytics account. For help getting started, you can read our step-by-step guide on how to properly set up Google Analytics and MonsterInsights. To access the eCommerce addon, you must have the Pro license plan. Need help? Glance through this post on how to upgrade your MonsterInsights license. 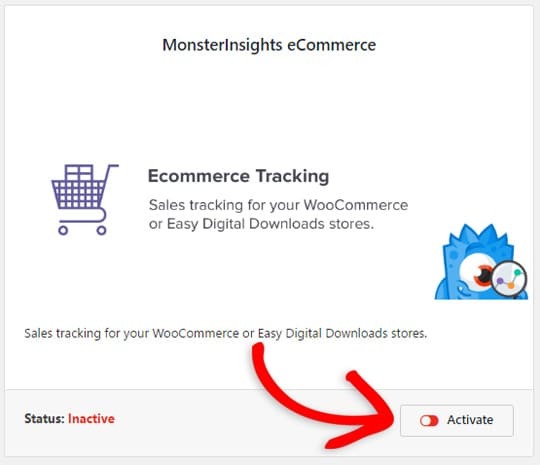 Then, go to Insights » Addons and click Install under the MonsterInsights eCommerce addon. After installing it, you’ll be prompted to activate it. Go ahead and click the Activate button to make sure the plugin is active and ready to use. 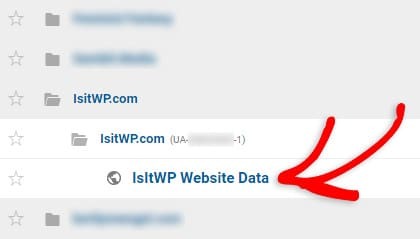 Now tracking will occur automatically without any further configuration of the MonsterInsights settings. Once you’ve completed setting up eCommerce tracking with MonsterInsights, it’ll gather your eCommerce site’s data and provides you with highly comprehensive reports. Best of all, you can see your most important eCommerce reports right inside your WordPress dashboard. 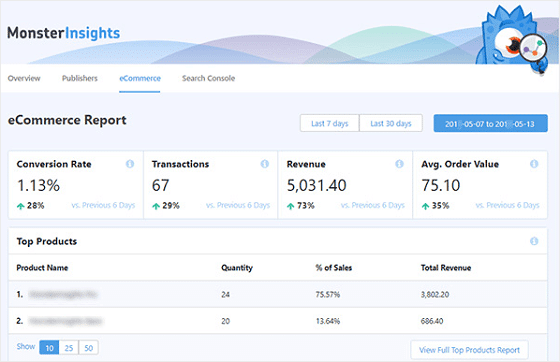 To view your eCommerce stats, you’ll need to visit Insights » Reports from your dashboard and then click the eCommerce tab. Now you can your eCommerce store’s sales data. You can see your store’s total transactions, conversion rate, revenue, and average order value. You can also see your top-selling products. As you scroll down the page, you’ll see your store’s top conversion sources and other reports useful for analyzing your customers’ shopping behaviors. You can see total add to carts, total removed from the cart, the average time to purchase, and sessions to purchase. Using this data, you can make informed decisions to grow your business. If you want to see these reports in detail, you can click the View Your Report button at the end of each report. Clicking on the button will take you to the Google Analytics platform. 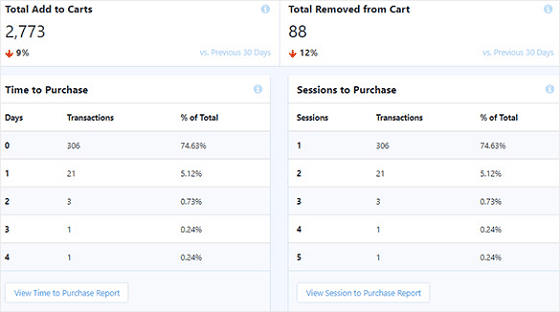 Then, you can explore your eCommerce reports in Google Analytics. To view eCommerce Sales (number of transactions) and revenue in Google Analytics, navigate to Acquisition » All Traffic » Source / Medium. Then click on E-commerce under the Explorer tab. In the table, you’ll see multiple columns, including revenue and transactions. 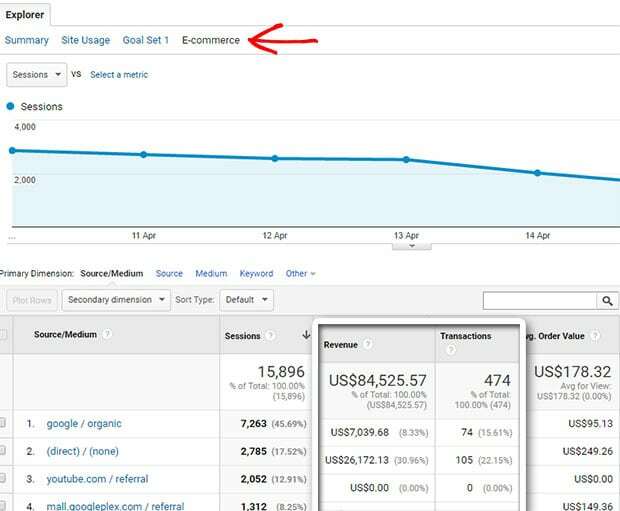 We hope this guide helped you to learn how to track eCommerce sales in Google Analytics. If you’re looking to boost sales and revenue from your store, you’ll also want to read this guide: 7 Mistakes that are Hurting Your eCommerce Conversion Rate and How to Fix Them.